SANDAG is a political Never-Never Land: A place where everyone seems to agree. There are reasons for that. “If someone speaks out, they’re ostracized,” said one longtime board member. After a second court earlier this month ruled SANDAG’s long-term transportation plan violated state requirements to cut greenhouse gas emissions, the regional planning agency’s board voted overwhelmingly to go for one more appeal. The board is made up of elected officials from all over the county. When the vote showed Councilman Todd Gloria was among those who favored an appeal, it got a lot of people wondering: Why is the guy who — through force of will — pushed the city of San Diego to pursue an aggressive plan to cut emissions siding with SANDAG after two courts said its plan would actually increase emissions by 2050? Gloria said he wasn’t trying to defend SANDAG, just seeking clarity on state greenhouse gas reduction requirements. A spokeswoman also said he had planned to vote against an appeal when he went into the closed-session meeting, until legal counsel explained the benefits of an appeal. Nonetheless, it highlights a long-running SANDAG dynamic: The politicians on its board don’t pursue policy changes there the way they do at city hall. Art Madrid, formerly La Mesa’s mayor for nearly 25 years and a longtime SANDAG board member, said there’s always been a go-along-to-get-along mentality in the agency. “If someone speaks out, they’re ostracized,” he said. He and other past and current board members offered a handful of explanations for the board’s reluctance to use its position to further major policy objectives. SANDAG has a gigantic budget. At $1.2 billion — mostly for transportation and large capital projects — it’s basically the same size as San Diego’s. On one hand, that makes the question all the more pressing. On the other, it could help explain why directors don’t want to make noise. That’s absolutely the perception among board members, Madrid said. “It’s not that blatant, but it’s the undercurrent there, quite frankly,” he said. It’s not that an entire city could get closed out of SANDAG’s funds for making a fuss, Madrid said. It’s more subtle. Cities compete for SANDAG grants. If two projects are equally deserving, there’s concern money will go to the city that’s been less disruptive. Ron Morrison, National City mayor and who’s on the board and previously served as chair, said there was a time when decisions were made that way, but now all decisions are made based on distinct criteria, so there’s less room for political retribution. He’s been plenty vocal at times, he said, sometimes voting against the wishes of other South Bay cities that expect his support, but has never felt it came at a cost to National City. “If there is that perception, I think it’s one not necessarily based on knowledge, on being perceived,” he said. But Madrid said even the criteria-based approach leaves room for subjective decisions. 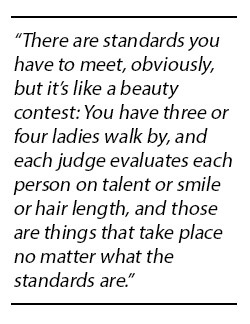 “There are standards you have to meet, obviously, but it’s like a beauty contest: You have three or four ladies walk by, and each judge evaluates each person on talent or smile or hair length, and those are things that take place no matter what the standards are,” Madrid said. Another explanation is that directors don’t have the capacity to challenge what SANDAG staff says is the best option, or suggest another course. The basic case is that SANDAG staff, and especially its executive director, Gary Gallegos, runs SANDAG, not its board of directors. To Erie, though, SANDAG and large planning agencies like it just aren’t set up to be a place for politicians to pursue a political agenda. He points to SCAG — the Southern California Association of Governments, a similar organization that’s even larger, representing over 180 cities from Ventura to Imperial counties — which also has never been used that way. “It’s staff-driven, and really it’s a forum for smaller cities to have a voice, and to have an organization to build regional consensus on things like border projects and freeways that require state and federal funding, where it’s beneficial to have a collective voice,” he said. Gloria spokesperson Katie Keach said that major SANDAG hearings, like its budget review, usually have only a few public speakers and are decided in a single meeting. “SANDAG enjoys not being on the radar,” she said. That’s beginning to change, she said, as activist organizations increasingly recognize the power it wields. But she said the SANDAG staff briefings Gloria receives on an item are always much more direct and understandable than the supporting materials put to the public ahead of a meeting. “The reports seem like they’re made complicated to deter interest,” she said. The one big exception to the board’s historic hesitance to insert itself in SANDAG’s operations was former Mayor Bob Filner. It was remarkable, multiple people said, when Filner showed up for his first meeting. Early on, the board had to approve hiring outside counsel for a legal issue. Filner demanded to know how much the organization paid for additional lawyers, and wanted to know why the board’s own lawyers couldn’t handle it. Staff didn’t have the answers. Madrid said it seemed SANDAG didn’t know how to react to that sort of pushback. Yet, no one could point to a political price paid by the city of San Diego as a result of Filner’s confrontations.